Your cover letter is the first piece of information a hiring manager reads about you. A well-written cover letter will display your personality and experience. 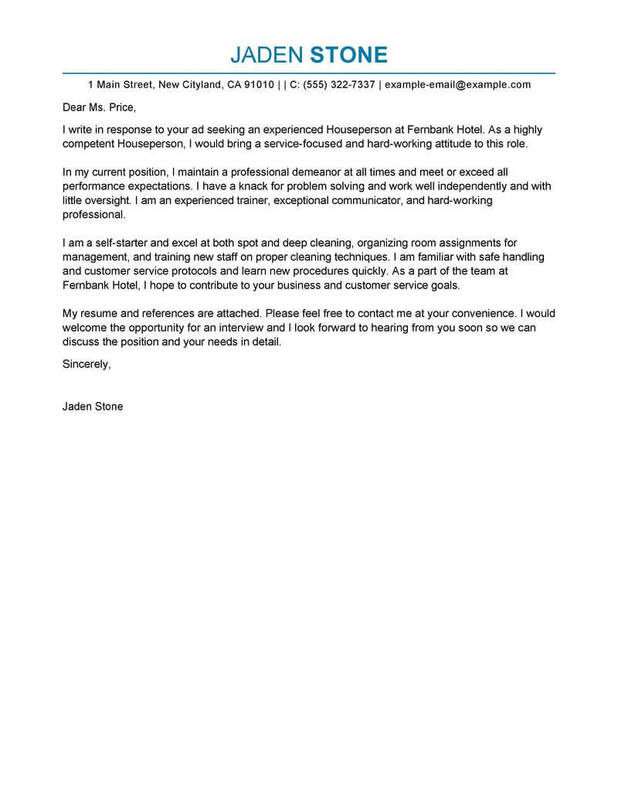 We have included a houseperson cover letter example for you to look over. Model your own work after it, and follow these do’s and don’ts to help you get your foot in the door at the job you want. Do address the hiring manager directly on your cover letter, including his or her first name and a title. If you can’t figure out who the hiring manager is even after researching, use the name of the department head for the position you want. Don’t make your cover letter too long. Remember the hiring manager will have quite a few letters to read. Never make it more than one page long. As you can see in the example cover letter, the writer kept it to about half a page. Do boost your confidence. By pretending the hiring manager already thinks you’re right for the job, you won’t feel pressured to make a huge sales pitch and will write easier. Don’t use pretentious wording. Keep things simple and direct. 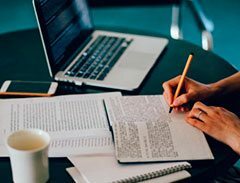 Do proofread your work to prevent unprofessional mistakes. A houseperson is in charge of cleaning and maintaining hotel rooms, including laundry, room restocking and more. 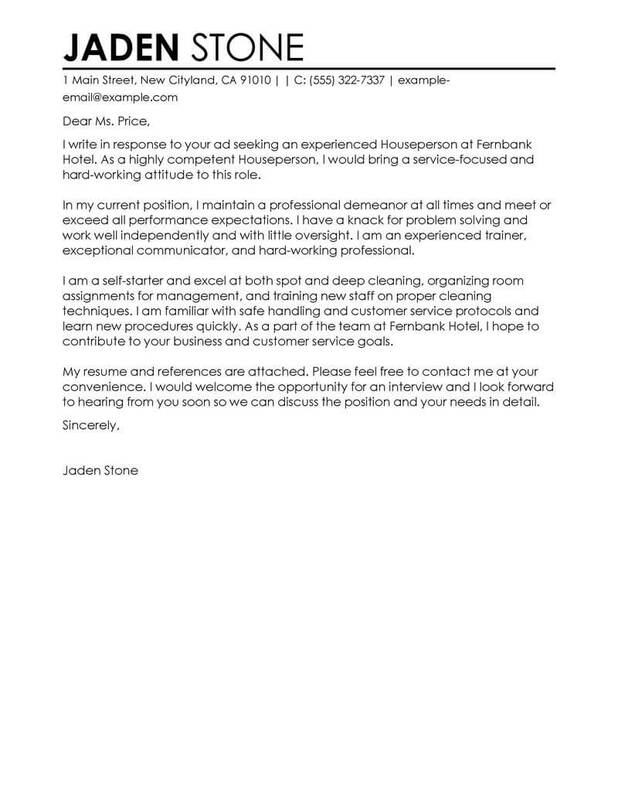 The cover letter examples below are designed to help you in creating your own houseperson cover letter. Choose from multiple template options to find the right cover letter design for you, and use our sample text as a guide. Click on any of the cover letter examples to start your cover letter now. 1. What are your best Skills?What job skills do you excel at? What do you have to offer a potential employer that can help them improve their business? Knowing how you can help them fill a need is the best way to getting in the door. Learn to communicate your best skills in your cover letter to get noticed by the employer. 2. Learn to write a great cover letterJust putting words on a paper is not enough to get the interview. Learn to create a great cover letter. 3. Why are you special?What is different about you that makes you stand out from the rest of the applicants? Learn how to communicate what makes you different and why you have what the employer is looking for. This will help you get noticed and could help you get the interview with the employer. 4. If you were boss. If you were the boss, what would you be looking for in a cover letter to make you want to offer an interview to someone. Put those things on your cover letter. 5. Simple LayoutYour cover letter needs to be easy to read and not filled with lots of unnecessary information. 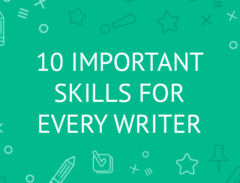 Learn to create a cover letter that highlights the most important parts of your job skills. When you are looking for work as a Houseperson or any place else, create an effective job search that can make the difference in getting a job. Here are five tips that can help you conduct an effective and successful job search. 1. Networking is KeyLearning to create an effective network will go a long way in helping you get the job you want. Never ignore those around you. Your friends and family talk to people all day long. You never know who might be looking for someone to hire that has the job skills that you offer. Learn to use your contacts effectively. 2. Positive AttitudeA positive attitude goes a lot farther than you might realize. Employers want to hire someone who is a positive influence on other workers. 3. Working on ImprovementWhen an employer finds someone that is self-motivated and works at improving their job skills it makes a very big difference. 4. Be professionalFirst impressions go a long way. You can create a great first impression, not just in your cover letter and attitude, but also in the way you dress. Learn to dress professionally. 5. Be PreparedAlways be prepared when you go into the interview. Try to imagine anything the employer might ask.